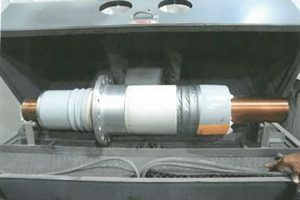 Insulated devices known as bushings enable an electrical conductor to pass safely through a grounded conducting barrier. Generator bushings are designed to lead current induced in the stator windings through the pressurized, hydrogen-gas tight, earthed generator housing. A typical bushing consists of a conductor surrounded by insulation, except for the terminal ends. 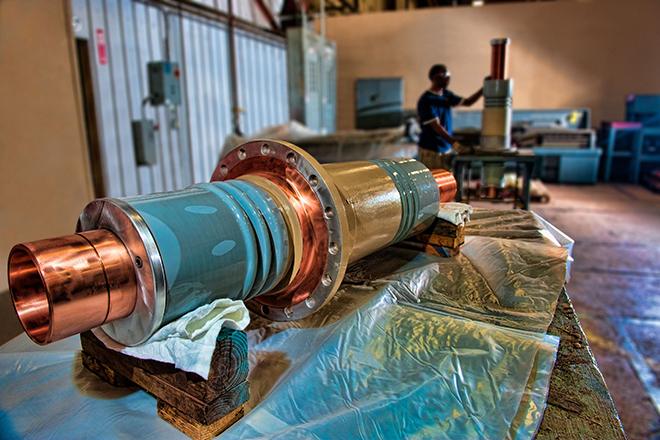 As part of its service offering, MD&A provides turbine-generator owners with the engineering know-how to test, analyze, and resolve bushing operation and failures. 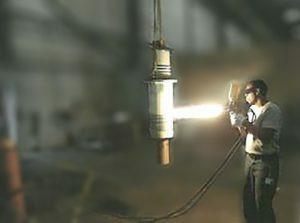 MD&A provides both the skilled technicians and the maintenance facilities to disassemble, clean, repair, and recondition or remanufacture multiple high-voltage bushings (HVB), simultaneously. 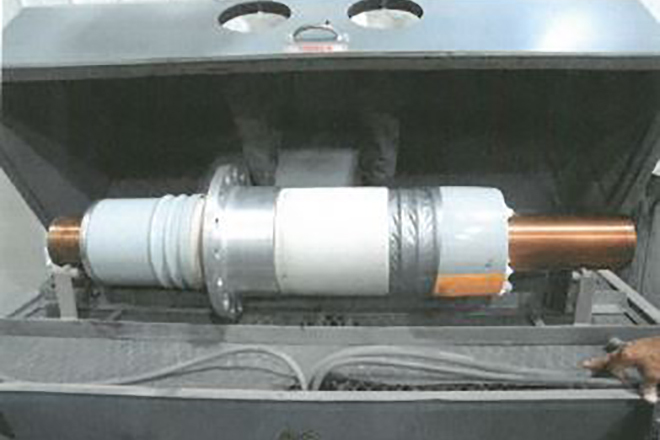 In one repair scenario, a GE® 4-inch hydrocooled HVB arrived with asphalt leaking from the air side of the bushing. At the start of a rigorous multi-step process, the bushing first was disassembled and its center conductor removed. Remaining asphalt within the equipment was heated and removed using a combination of thermal exposure and immersion in cleansing solution. Technicians completed the cleaning by hand to ensure that all asphalt was out, and that all oxide, sharp edges, and burrs were burnished away. Bushing reassembly followed, including fresh asphalt. 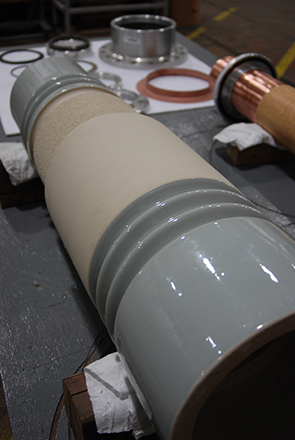 The equipment then was ready to have its porcelain components machined and repaired. Technicians machined off the old flange and the bushing was placed into a sand blasting tent. The technicians then verified that both the flange and porcelain fit areas were clean before reassembling the equipment. Electrical and pressure tests were conducted using helium as the pressure agent. No loss of pressure is permitted during these tests. A high potential test was conducted with up to 68kV DC gradually applied and then removed. Doing this allowed technicians to look for current leakage throughout the test. Just before shipping, the bushing was painted and silver plating applied as needed. One final quality control inspection was completed by an MD&A QC inspector who works separate from the shop personnel who did the work. The bushing then was packed and documented in its shipping crate to verify its secure positioning before leaving the MD&A facility. MD&A’s also provides comprehensive refurbishment & repair of large utility generator stators and fields. Our large generator repair specialists conduct full scope electrical testing, visual inspections and specialty tests as per customer requirements. Have MD&A look at your high-voltage bushing today, call our Turbine-Generator Repair Facility at (314) 880-3000 or use our Contact form. Q: What is the typical lifespan of a refurbished bushing? Q: What is the typical timeframe to refurbish a bushing? Q: Does MD&A stock refurbished bushings? A: Yes – We will also offer same day swap outs. Q: How many times can a bushing be refurbished? Q: What percentage of porcelains need to be replaced? A: 5 – 10% – Due to cracks or damage during flange removal.